The Level 2 Award in Fire Safety is a qualification aimed at anyone involved in the management of fire safety in any workplace. 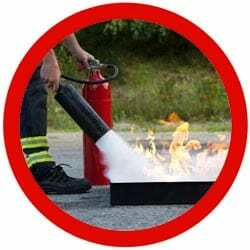 This includes managers, supervisors, team leaders, fire wardens (marshals) and staff working in any area where there is a potential risk of fire. Learners gaining this qualification will know that fire safety is the responsibility of everyone in the workplace and will recognise the consequences of a fire in any premises. Group activities and discussion presentation, workbooks and practical workshop.